I’ve followed Patrick Rhone’s work for years now because he just keeps coming out with awesome. Also, he’s just a great human being. Patrick is one of only a few writers out there speaking intelligently and thoughtfully on how real people interact with technology. 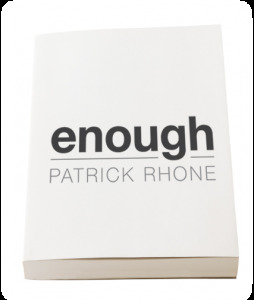 Equal parts philosophical musing and practical advice, Rhone’s most recent book, Enough, explores what it means to find that balance between too little and too much in life. You’ll notice this work doesn’t just address social media and gadgets; Patrick brings unique insight on existing mindfully into multiple spheres of life. Enough is as useful and applicable as it is a pleasure to read. Enough prompted me to pause and ponder the implications of what I have and what I need in new and fresh ways. I know it will do the same for you, too. Buy the book and find out more here.